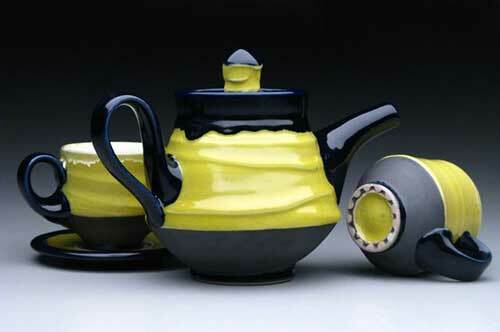 University of Alaska Southeast art major Bonilyn Parker won two prestigious national awards at the the 2010 National Student Juried Exhibition at the National Council on Education for the Ceramic Arts (NCECA) convention held March 31-April 3 in Philadelphia, Pennsylvania. Parker was one of only 41 students to make the cut for the event. During the opening reception she was presented with The Rodger Lang Award for Student Excellence and the Studio Potter Magazine Undergraduate Award. NCECA is the biggest Ceramics organization in the world, with more than five thousand people attending the annual conference. "The name of the piece is TGAT, it stands for The Great Alaskan Tea-set," Parker told the UAS student newspaper Whalesong. "I use teapots every single day and it just makes me think of my life here in Juneau and I wanted to express some of my Alaskan feeling nostalgia in the title, just kind of express what I think about it when I see it, and my professor Jeremy Kane is in a band called the Great Alaska Bluegrass Band and so it’s kind of a joke on him too, it’s kind of arrogant but it’s kind of funny and I think it gets my point across." The NCECA National Student Juried Exhibition featured 19 undergraduate and 21 graduate students from around the country and was hosted by the University of the Arts’ Rosenwald Wolf Gallery in Philadelphia. "I was so excited to even get into the show, I was very surprised and just ecstatic to receive two awards," said Parker. "I feel very lucky and proud to accept these awards and grateful that my professor Jeremy Kane could be there with me."